Bruns-Gutzwiller, Inc. has been striving to be the best in the construction industry since 1920. As General Contractors & Construction Managers, we have achieved a reputation for skill, integrity, and responsibility that is unmatched in southeastern Indiana. This history of uncompromising commitment to quality makes Bruns-Gutzwiller uniquely qualified to act as Construction Manager or General Contractor for any client. Or firm is staffed by construction and business professionals with more than 100 years of construction experience. Bruns-Gutzwiller has constructed and managed projects from a few multimillion-dollar project efficiently and effectively, yet we are not too large to forget the value contractor/construction manager in southeastern Indians. We strive at every opportunity to give our clients a quality project on time and under budget. Bruns-Gutzwiller has the ability to aid in your selection of an Architect, due to our superior relations with architects & engineers across the Tri-State. We will make ourselves functionality, and material selections. Our extensive experience in construction has allowed us to form intimate relationships with almost every architectural firm in Indiana. This ensures smooth coordination between design and construction. Based upon the needs of the client, Bruns-Gutzwiller would establish a conceptual budget prior to design, as early as the schematic and design phase. As the building design becomes solidified, a more detailed estimate will be established to provide the owner timely information as to the estimated cost of the project. We will also evaluate all bids and bidders. Each of these stages is performed and checked using a network of personal computers and shared database of regional constructikon costs, as well as our company’s own historical cost data. Bruns-Gutzwiller will offer completed and wide-wide rangin scheduling options to the owner. We will offer suggestions as to the form of the schedule, but will design a schedule to meet the specific needs of the project. The project manager will create the logic of the schedule, with input from the Architect and contractors. The schedule will be updated as needed to ensure that the project is completed on time. We will monitor and report on the progress of the project. We will conduct meetings at various stages of the pro-bid process, as well as progress ensures the project is completed on time and under budget. The project manager on each Bruns-Gutzwiller project is an owner of the company. Their own personal attention to the project carries forward to our other project personnel. All daily operations on the site are monitored and recorded by the project superintendent. Our supervisory staff is second to none in quality control, organizational skills, and construction savvy. Our average superintendent has more than 20 years of construction supervision experience. It is their input that enables the project manager to make informed decisions critical to the project’s cost and completion. Together thes two individuals ensure a successful project. Your project will also be a safe project, as we have a full-time safety manager on staff. Weekly safety inspections will be performed, in addition to the safety monitoring preformed by our project superintendent. A safe job is a successful job! 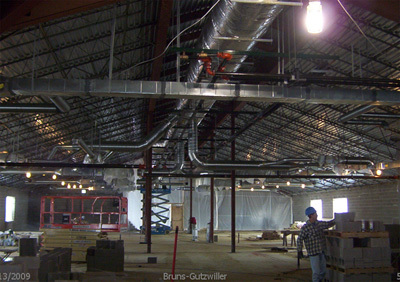 In addition, Bruns-Gutzwiller has the experience and the manpower to self-perform on your project. We regularly self-perform concrete, masonry, & carpentry. We will present a detailed hard quote for the project or, if you prefer, perform any selected scope of on a Time & Material basis. Bruns-Gutzwiller self performs several different aspects of a construction project. We have experience in helping recommending, evaluating and selecting architects. A principal of the company will be managing the project for the entire duration. Bruns Gutzwiller has constructed almost every type of structure imaginable. We feel that we have an intimate knowledge for the quality you expect and, as CM or GC, we can ensure that you receive the same level of quality and service you would expect if we constructed the project ourselves. 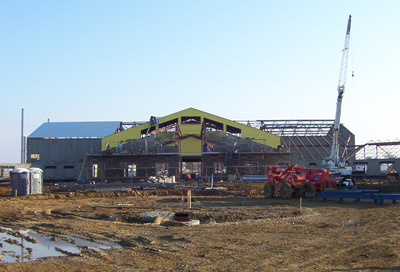 We are a preferred choice for construction services throughout Southeastern Indiana.